Realvove is a very simple and straightforward CRM system for real estate professionals. The program provides easy-to-use lead management and tracking system and offers other features that are attractive to customers without requiring complicated templates of functions. The company touts the ability of their Workflow Platform to be able to handle the most common systems to the most sophisticated, advanced systems that are needed for real estate teams of any size. Realvolve’s CRM was designed to integrate with all of the other technology platforms and services you use on a daily basis to make the management of your leads, contacts, and sales simple and easy to use. The idea behind Realvolve’s CRM system is to make it as simple and easy-to-understand as possible for real estate agents to use. The company knows that real estate professionals don’t have the time to click through many screens to accomplish the most basic tasks, and so it broke down the process and simplified it for ease-of-use. That being said, the Realvolve CRM features are not basic by any means. The other nice part about Realvove CRM is they protect your data by backing it up twice a day and utilizing high-security features on the back-end. Realvolve CRM offers four different pricing plans, based on the number of members on your team who will be using the program. All plans are paid annually and come with 50,000 contacts and unlimited storage. They also all provide listings, transactions, tasks, and date tracking, and files as part of the plan. 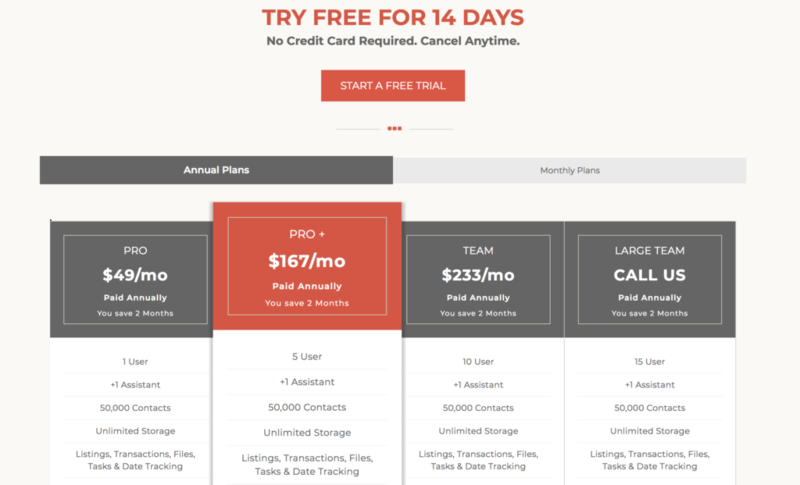 Finally, all plans come with a free 14-day trial that allows you to try it out with no commitment. All plans also come with the ability to add one assistant to the team. Realvolve provides all the typical customer service and support avenues such as telephone, email, live chat, and even social media availability. Realolve takes their customer support one step further by providing a lot of How To videos and demos on their website, as well as a podcast that provides tips, best practices and training. In fact, the company provides an entire Training page on their website that shows users how to do some of the most popular and basic tasks with the CRM. This extra level of resource is a great perk of working with Realvolve, as sometimes, it’s easier to just view a tips video or demo than it is to reach out to customer service via email or phone. While it may be considered a positive to some, the fact that Realvolve’s CRM system is so simple may actually be a negative to others. More technologically advanced real estate teams – or those with very large teams – might desire a more tech-savvy CRM that can handle more complicated tasks. These types of teams often desire ease of use, but more than anything, they desire advanced functionality and impressive features. This is how the program was designed, though, with the idea that it would appeal to more users who just wanted to be able to handle the basic tasks of CRM without the hassle of complicated modules or setup. For teams that want some extra customization, there is an element of time that comes into getting that done, which could be a negative to those who need to get off the ground running.